Home Blogs What’s In A House? It’s the inevitable question – one that every Harry Potter fan has pondered. It’s how we label our dominant personality traits, make guesses about our friends, and sometimes even pick our favorite characters in the series. I’m talking, of course, about these four words: what house are you in? Sorting is no easy task because people, in all of our weird and wonderful glory, are way too complex to fit nicely into four clean categories. But every year without fail, the Wizards and Muggles executive board gathers together and reads fifty or so sorting quizzes to try their hardest to see how each of these people think and feel so we can place them where they best belong in our little version of Hogwarts. After that, the invitations to the Sorting Ceremony are sent out and, well, you can guess the rest. All of the Houses have their own traditions and general personalities. While the Ravenclaws spend time discussing classes and life and pretending they don’t have a ton of homework, the Gryffindors love watching movies together – and Pride and Prejudice is necessary viewing. The Hufflepuffs, always in an effort to build friendships, pass around a journal where each week one member gets the opportunity to write a little bit about themselves. 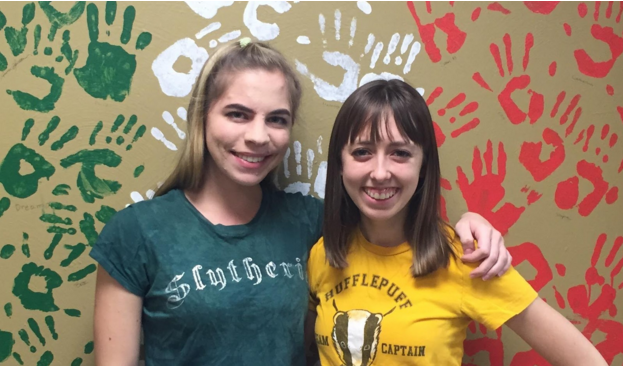 The Slytherins have an incredible sense of pride for their House that they want to share with everyone, and last year they won the House Cup by a landslide. They love mixing with the Hufflepuffs for movie nights, game nights, and other events, which is an unexpected yet fabulous dynamic between two seemingly opposite Houses. Those who are different from us enrich our minds. While we love our Houses and spend most of our time with them, the members of WizMug also enjoy bonding with the club in general and it’s very common to find inter-House friendships and even roommate pairs. Friendships between people from the four corners of WizMug remind us that spending time with those who are different from us enrich our minds by allowing us to empathize with people who think in diverse ways. If you ask me, I’d say Dumbledore would be pretty proud of us.